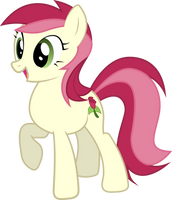 Roseluck is so fun to vector, I love her color scheme. Used this in a test of some image software, I was wondering if it'd be okay to upload the results provided I credited you. Why do I love Ponies giving bedroom eyes so much ? Good stuff. Can't have too much Roseluck. Her Cutie mark is backwards though! Bedroom eyes? Or do you mean flirty eyes? What I mean is the meaning, I'm confused. There's no such vocabulary that says bedroom eyes, that's why I want to correct that and say flirty eyes. Bedroom is already easily comes to mind is, you know what I'm talking about and I don't want to say it openly. Very nice. There is much potential for captions here.